Rodney McAree was on hand to kick off this year's BetMcLean.com League Cup competition. McAree led Dungannon Swifts to the first piece of major silverware in last year's tournament following their 3-1 win over Ballymena United. Dungannon Swifts manager Rodney McAree pictured with competition sponsor Paul McLean from BetMcLean and NI Football League Manging Director Andrew Johnston. The Swifts boss helped out with the first round draw on Wednesday morning alongside Paul McLean of sponsors BetMcLean, and he was delighted to be back at the scene of his triumph again. 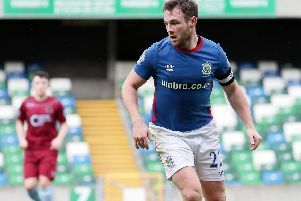 "I've some great memories from Windsor Park after the League Cup final, and it's great to be back here again for the first round draw," said McAree. "It was a great occasion for Dungannon Swifts and one which we thoroughly enjoyed. "We want to kick on again this season but we know it will be extremely difficult and we can't be over confident. "We have to understand what we have achieved over the last 15 seasons to maintain our position in the Irish Premiership, which all starts with hard work. "We have to make sure we deliver that week in, week out." The BetMcLean.com League Cup action kicks off with four first round fixtures on Saturday 4 August, with the introduction of the remaining teams, including the Danske Bank Premiership clubs, for the second round later in the same month. NI Football League Manging Director Andrew Johnston said: “The vision and dedication of BetMcLean has helped us lift the competition’s profile during the first year of sponsorship last season. Fixtures to be played on Saturday 4 August. Twelve clubs received byes into the second round of the competition, namely: Annagh United, Ballyclare Comrades, Banbridge Town, Dergview, Dollingstown, Larne, Limavady United, Loughgall, Moyola Park, Newington YC, Portstewart, Sport & Leisure Swifts, Tobermore United.